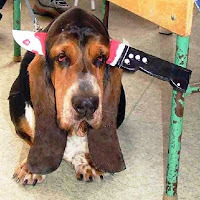 People do the craziest things to their dogs. The empty nest Mom can be the worst with our dogs as they often times are the "replacement child" in our lives. A friend of mine sent me these shots of dogs dressed in Halloween costumes and frankly, I think they are adorable. 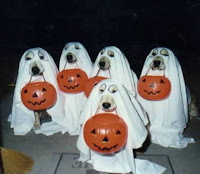 The costumes seem to fit the personality of each dog so perfectly. 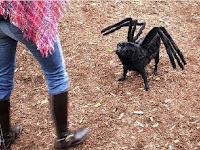 Having seen these, I search for the perfect costume for my golden retriever. Which do you like best? Wrigley is going as an obedient, well-trained puppy as he is staying with his trainer while we are off visiting Laura at her college parents' weekend. It's a hard outfit for him to wear, but he will look adorable as ever. Beth... that is hilarious because I dress my dog up in a ghost costume every halloween. Johnny used to walk around with Phill(our dog). But this year, he opened the door with me and barked at all of the innocent trick or treaters. Very varied blog and jolly interesting. Thanks for popping by mine, when I get time I'll be back!